Minority Rights Group International (MRG) warns that the rhetoric of the recent US elections, particularly from the campaign of President-elect Donald Trump and his supporters, will harm minority communities around the world. Civil rights groups are already reporting an increase in acts of hate against US religious and ethnic minorities in the week after Trump won the election. Given that Trump will shortly lead the next US administration and the country’s preeminent role in international affairs, MRG now warns that his campaign will be copied elsewhere. The past week’s increase in hate crimes occurs against a backdrop of a further rise, particularly targetting Muslim Americans, during the election campaign. On 14 November 2016, the Federal Bureau of Investigation (FBI) released a report on hate crimes in the United States during 2015. The report noted a dramatic increase in the number of attacks against Muslims. There were 257 reported incidents of assaults, attacks on mosques and other hate crimes against Muslims last year, representing a 67 per cent increase compared with the year before and the highest figure since 2001. The overall total of bias-based crimes rose by 6 per cent compared with 2014. African Americans remain the most frequent target of race-based attacks, and Jews are still the most common victims of attacks based on their religion – but the attacks these communities faced did not increase as dramatically as those targetting Muslim Americans. 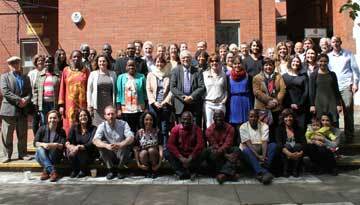 Minority Rights Group International (MRG) is the leading international human rights organization working to secure the rights of ethnic, religious and linguistic minorities and indigenous peoples. We work with more than 150 partners in over 50 countries. Each year, MRG publishes its online survey Peoples under Threat which ranks countries according to the risk of violence or mass killing against marginalised communities. 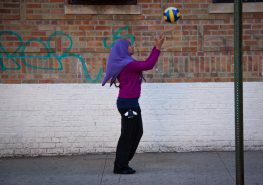 Photo: Muslim girl practices volleyball in New York City, US. Credit: Chris Goldberg.